OTOY • OctaneRender 4™ is out today! OTOY® once again advances the state of the art of GPU rendering with the release of OctaneRender 4™ – available now – with groundbreaking machine learning techniques, out of core geometry support and massive 10-100x speed gains in the scene graph. Los Angeles, CA. – November 21st, 2018 – OTOY, Inc. is proud to announce the official release of OctaneRender™ 4, building on a decade of advancements that have revolutionized commercial GPU rendering across film, television, motion graphics, architecture and design. Octane 4 integrates dozens of industry-first breakthroughs into the world’s fastest unbiased GPU renderer – including state of the art Spectral AI Denoising, AI lighting, high performance out-of-core geometry and 10-100x speed ups in the scene graph and viewport. OctaneRender 4 is available for purchase today, and is a free upgrade for all Octane 3 users. New Octane 4 annual ‘all-access’ subscription plans, starting at $19.95 month (1 year minimum), unlock ‘all you can eat’ access to the industry’s largest ecosystem of integrated DCC plugins – including Maya, Cinema 4D, AutoCad, Revit, Houdini, Blender, 3ds Max, After Effects, Nuke, Unity, and soon, Unreal Engine. 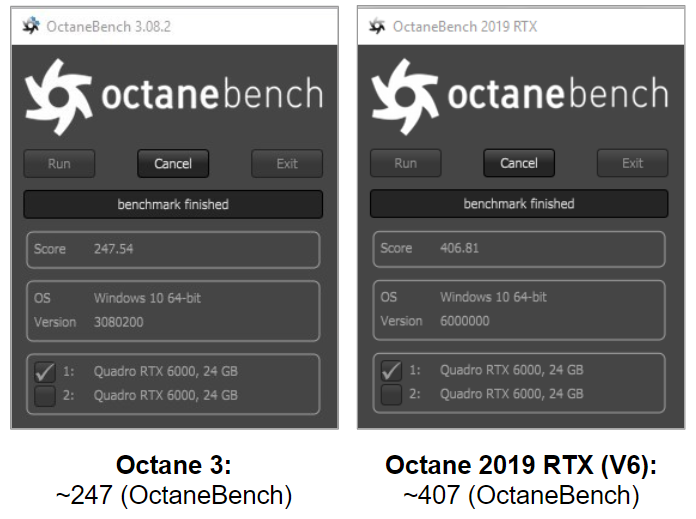 Octane 4 can render fast out-of-core geometry from CPU memory, with minimal speed loss, even across multiple GPUs – a first for an unbiased GPU renderer. All meshes and textures can, if desired, be stored in CPU memory while Octane is rendering at fully interactive speeds with no viewport latency. Scene AI models visibility of surfaces in real time to dynamically move geometry in and out of core for maximum performance. Octane 4 introduces groundbreaking machine learning technology to interactively denoise beauty and AOV passes on-the-fly, both in the viewport and for final frame production rendering. Octane’s state of the art Spectral AI Denoiser operates on internal perceptual models of material, spectral irradiance and scene data deep in the engine. 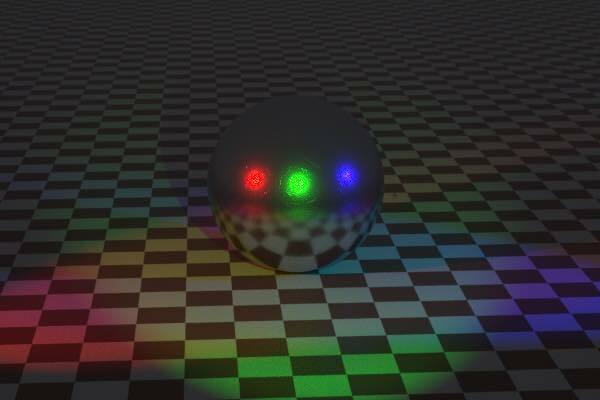 Domain specific AI denoisers help with glass, refractions, SSS, depth of field and motion blur, reducing render times by 50-100x in noisy scenes. Octane’s Volumetric AI Denoiser removes noise in volumes (and volume passes) that previously required tens of thousands of samples to achieve noise free results. 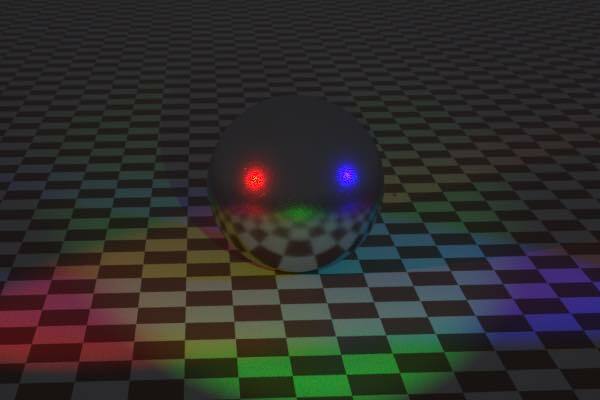 AI Light further complements the AI Denoiser; it is fully unbiased, and tracks emissive points live, in real-time with up to 6-10x speed improvements for scenes with many small light sources such as multi-point or spot lights. 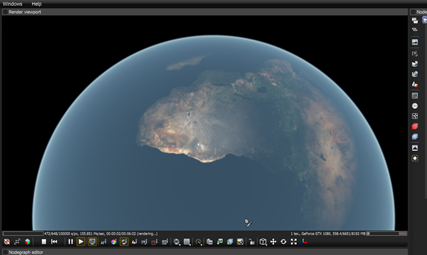 The new planetary environment in Octane 4 is based on the Nishita sky model, and simulates the scattering of sunlight in the upper atmosphere and space. It expands physics and lighting conditions to support atmospheric shaders and planet shaders with unbiased path-traced accuracy. With Universal Materials in Octane 4, the process of combining different materials is dramatically simplified, enabling artists to use a single ‘uber’ material to achieve the complexity of what previously required multiple types of material mixes – such as diffuse, specular, glossy and metallic. Universal Material incorporates multiple BXDF lobes including: Specular Transmission, Diffuse BRDF, Specular Reflection, Coating, and Sheen. OctaneRender 4 now provides Substance PBR texture integration in DCC tools such as C4D and 3ds Max. For production texture workflows, OctaneRender 4 supports UDIM textures through a new image tile texture node enabling artists to set up custom tile grids. 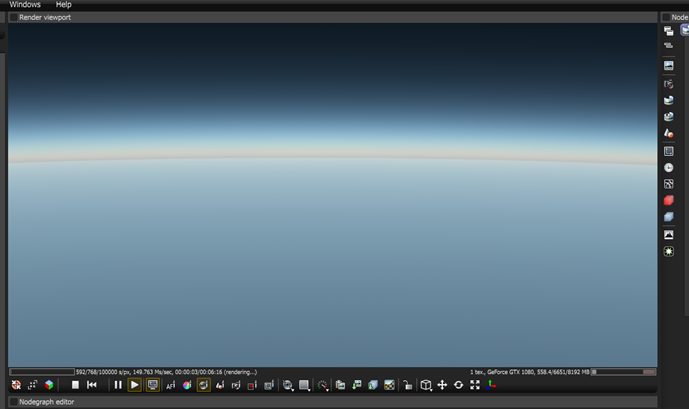 Dynamically compressed textures in Octane 4 can use 1/3 – 1/8 the VRAM of normal RGBA, grayscale and float textures. Compressed textures incur zero speed loss, and are nearly identical in visual quality to uncompressed textures. 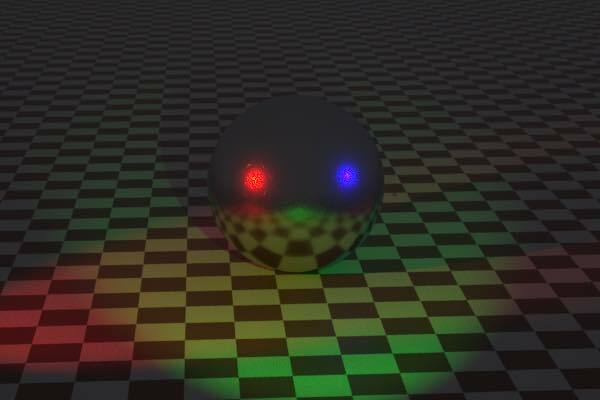 Material IOR in the base layer of Universal Materials can be controlled procedurally with Texture nodes and OSL shaders connected to a new 1/IOR texture input pin. EXR layer ingest in texture nodes can be used to reload multi-layer OpenEXR output files into an OSL post-processing and compositing nodegraph. OpenEXR importing and exporting allows artists to perform granular per-render-layer beauty and lighting pass compositing, denoising, blending, filtering, relighting, and color correction – with the full power and flexibility of OSL shader nodes. 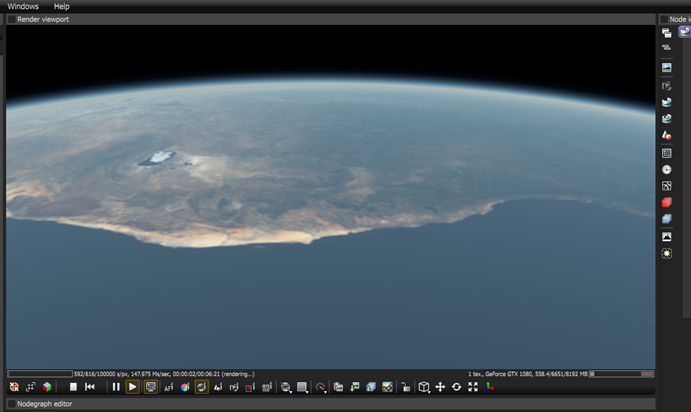 Artists can use OctaneRender’s internal ORBX scene translation system to flatten and export scene geometry, allowing you multiple geometry graphs to be exported in one FBX or Alembic file for 3rd party toolchains. With new annual ‘all-access’ subscription plans, starting at $19.95 month (1 year minimum), artists can get ‘all you can eat’ access to the industry’s largest ecosystem of integrated DCC plug-ins, with cloud rendering (ORC), a secondary render slave licence and continuous future updates beyond Octane 4 for enterprise customers. Octane annual ‘all-access’ subscription plans, beginning in Q1, will enable artists to access multiple DCC plugins from OctanRender Studio – including Maya, Cinema 4D, AutoCad, Revit, Houdini, Blender, 3ds Max, After Effects, Nuke, Unity, and soon, Unreal Engine. For perpetual licence/enterprise customers, All-Access plans further grant a secondary render slave node plus continuous access to all future updates and features beyond OctaneRender 4, including NVLink (starting with Octane 2018.1 – XB1) and full RTX hardware acceleration on Turing GPUs coming with Octane 2019. 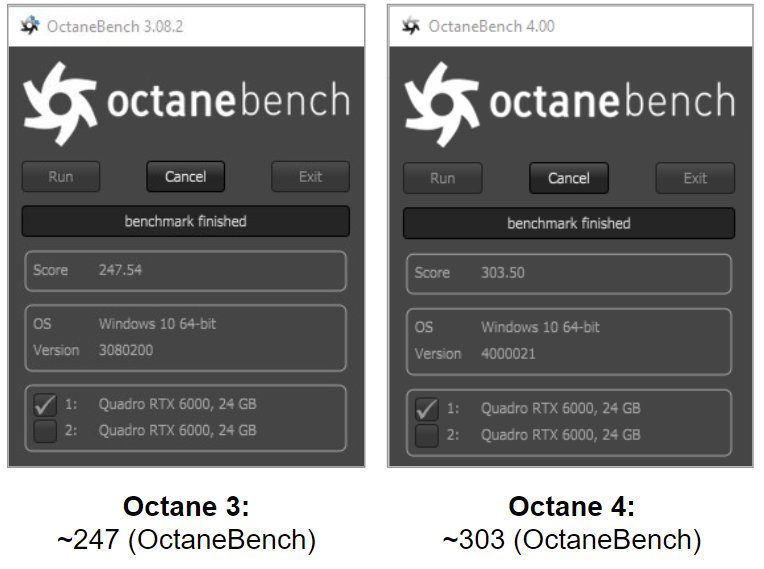 OctaneBench 6 already exceeds 400+ OB on a single GPU. Read more about the features of OctaneRender here.